During Nintendo’s pre-E3 Super Smash Bros. 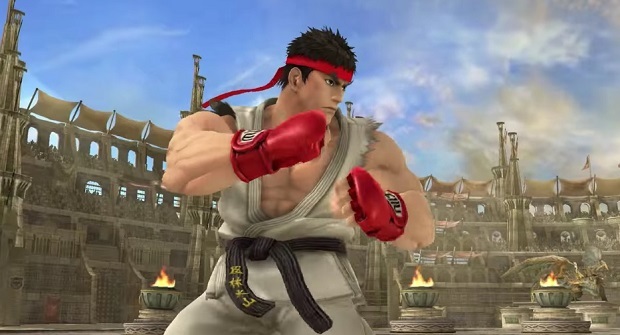 Direct, the company confirmed ongoing rumors that Ryu from Street Fighter and Roy from Fire Emblem would be joining the Super Smash Bros. for 3DS and Wii U roster. Ryu and Roy are launching today, alongside returning fighter Lucas. Roy and Lucas are available on either 3DS or Wii U for $3.99, or can be bought for both systems for $4.99. Ryu costs a little bit more as he comes bundled with his Suzaku Castle stage, with downloads on separate systems costing you $5.99, and both 3DS and Wii U versions of the character costing $6.99. Alongside character DLC, Nintendo confirmed the addition of multiple Mii Fighter costumes that can be used for certain classes. The 3DS and Wii U versions of each costume can be bought for $0.75, or bundled together for $1.15. During the Direct, Nintendo also confirmed upcoming Amiibo figures that are due out in September alongside the previously announced Bowser Jr., Ganondorf, Zero Suit Samus, Olimar, and Dr. Mario. These additional Amiibo include R.O.B., Duck Hunt duo, Falco, and Mr. Game & Watch. The Mr. Game & Watch figure will differentiate itself from other Amiibo in that it will come with interchangeable poses.